In the Mesopotamian religion, there was a group who worshiped a dog deity and had a temple referred to as ‘The Dog House’. In the ancient Egyptian religion, Anubis, the god of the afterlife, had the head of a jackal. Zoroastrianism included the proper treatment of dogs in their holy books and required that dogs had funerals similar to those of humans. Is it surprising, then that quite a few modern religions have special days for our four legged friends? There are scores of pet’s festivals across the world. In fact, many of them are tied to charitable events to raise money and awareness about pet adoptions and other great causes. Here are a few festivals that are sure to keep your pet’s tail wagging year after year. 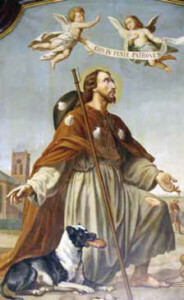 Saint Roch was born in Montpellier and was the son of the city’s governor. Early on, his life was marked by a series of miracles, including being born to a barren mother and bearing a birthmark in the shape of a red cross on his chest. His parents died when he was twenty, and despite being ordained as Montpellier’s next governor, he gave away his possessions so he could travel to Rome to care for plague victims. When he became ill, he retreated to a nearby forest to die, but a nobleman’s hunting dog brought him bread and healed him by licking his wounds. Today, he is known as not only the patron saint of the sick but also the patron saint of dogs. He is often depicted with a plague sore on his leg and a dog by his side. To commemorate his death, the Feast of San Rocco is held on 16th August across the world. In Tarija, Bolivia, the Fiesta de San Roque runs for eight days, and many dogs sport colourful ribbons around their necks throughout the festival. A procession of animals–dogs, cats, hamsters and even horses–is led to churches for a special ceremony called the Blessing of Pets. This custom is conducted in remembrance of St Francis of Assisi’s love for all creatures. 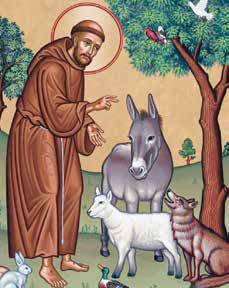 Saint Francis is known for his love of nature, and he preached to not only humans but to animals as well. According to the Fioretti, when Francis heard of a wolf that had been terrorising the city of Gubbio, he traveled to its lair and asked the wolf for peace. Francis told the wolf he understood that it “had done evil out of hunger,” and he formed a pact between the wolf and the townsfolk. The people of Gubbio would feed the wolf, and in return, the wolf would no longer menace the town. The feast of Saint Francis is held on 4th October and includes the Blessing of Animals—a ceremony held at church to welcome and bless any animals brought to its doors. According to the Mahabharata, when the king of righteousness Yudhishtara was asked to abandon his dog before entering heaven, he refused. His dog turned out to be Dharma, his god-father, in disguise. They also believe that two four-eyed dogs serve as the messenger of Yama, the god of death, and can be found guarding the gates of the afterlife. five-day festival celebrating various animals, the second day of which is the Day of Dogs. On this day, dogs are treated as the kings (and queens) of their homes. People even pray to their dogs for their homes to be protected. 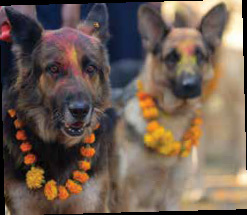 Dogs are given a special meal, adorned with flower garlands, and a red tika is drawn on their foreheads. Even stray dogs are treated as holy on this day. Woofstock is North America’s largest festival for dogs. Boasting over 300,000 annual attendees and 250 vendors and exhibitors, Woofstock is a both a non-stop, weekend long outdoor dog festival and a consumer expo. When the Woofstock Dog Festival first opened its doors in 2006, its founders wanted to create an event catered to the dog lovers in the Roanoke area, creating a super fun, family-friendly festival where attendees can freely bring dogs. Now, just a few years later, the festival has grown to be one of the best-loved events in the region, boasting live bands, food and drink, raffles, prizes, vendors games and more each June. In the traditional 15 days celebration of Chinese New Year, the second day is considered the birthday of the dog. This day is believed to be connected to TsaiShen, the goddess of wealth, so it is traditional to eat wontons. Many people will pray to their ancestors on this day and married women traditionally visit their birth parents. Pet dogs as well as strays are supposed to be fed especially well on this day. Founded in 1979 by a small group of fun-loving friends, Do Dah Day is one of Birmingham’s oldest and best-loved events, drawing people from all over the United States to the city’s historic Highland Avenue parks of Rhodes and Caldwell in May. What started out as a simple party has grown into an all-out music festival enjoyed by pet lovers and their four-legged friends. One of the festival’s best events is the parade, which offers prizes in categories such as best pet, best pet parents look-alike, best dressed pet and ugliest pet. Nashville’s Dog Day Festival takes puppy love to new heights every September at Centennial Park. An all-day event benefiting the Nashville Humane Association, the Dog Day Festival kicks off with the Music City Mutt Strutt dog walk fundraiser. The event also features dog training classes, dog adoptions, contests with wacky awards such as ‘Waggliest Tail’ and ‘Best Bark,’ doggie treat samples and craft time, live music and so much more. If you ever find yourself on the island paradise of Hawaii, make no bones about stopping by the Aloha Pet Festival in Honolulu. Talented pooches can try their paws at the pet costume and trick contests. And to end a perfect day, treat your canine companion to delicious delicacies like pet shave ice and doggie donburi while you munch on offerings from over 13 food trucks and vendors at the aptly named Bow Wow Brunch. Oregon’s coastal town of Manzanita comes alive with furry critters in August with the Muttzanita Festival, a pet-centric charity celebration that goes to benefit United Paws of Tillamook, a local volunteer organisation focusing on spaying, neutering and adoption. The canine fun never ends at Muttzanita, where dogs are treated to massages, ‘pawdicures’ and other spa treatments, and can be featured in the hilarious pet fashion and talent shows. And just for laughs, dogs can participate in fun games like musical chairs and fetch. In addition to being one of Chicago’s most eclectic, cutting edge street fairs, West Fest is also one of the most pet-friendly festivals in the Windy City. One can find delicious local food, high quality live music, diverse vendors and booths and a fun, hip vibe at West Fest, but it’s Pet Fest, the ‘fest within a fest’ dedicated to pets that really makes this festival stand out. From pet product vendors to bathing pools and a number of great pet games for charity, West Fest is the place to be in Chicago for pet lovers. In 2016 it will be organised from July 8-10 at Chicago Ave between Damen & Wood. 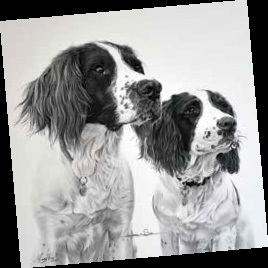 So, enjoy these festivals with your pooch and celebrate the love and companionship. (Dr Ashwani Kumar Singh and Dr Kumar Mangalam Yadav are interns at Government Veterinary Hospital, Bharatpur, Rajasthan).